Who can benefit from Hematrix? Hematrix can be used effectively in patients on anticoagulant therapy. For these patients, it is especially important to stop bleeding at once because every bleed can mean a massive loss of blood. Hematrix is used successfully in this group of patients. Compression dressings are usually contraindicated in patients with disorders of arterial blood flow. 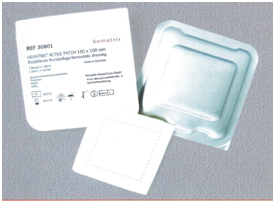 Hematrix Patch makes it possible to treat even arterial bleeding without applying extreme compression over a long period.